At Steinberg, Burtker & Grossman, Ltd. we welcome the referral of clients from other attorneys and law firms. A significant number of our firm's clients are referred to us for representation in personal injury matters. Other firms feel confident sending their clients to our firm because of our impressive track record. In addition to other attorneys, we regularly receive referrals from doctors and surgeons whose patients have suffered personal injuries caused by others. 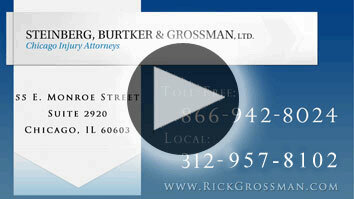 At Steinberg, Burtker & Grossman, Ltd. we understand that our client's and their referring attorneys expect results. We aggressively seek the maximum fair recovery allowed by law. If you are an attorney or medical professional, please contact our law firm today toll-free at 866-942-8024, and we can discuss the best plan for your client. Fee splitting is discussed in Rule 1.5 of the Illinois Rules of Professional Conduct. The Rule allows for fee splitting if certain conditions are met, the most important of which involves the consent of the client to the arrangement. The client must be informed of the existence of the agreement, the division of labor and responsibilities, and the economic benefits to accrue to each attorney (Rule 1.5(f)). We understand and respect the relationship between referring personal injury lawyers and their clients. We welcome the expertise referring attorneys bring to the table when associating on catastrophic injury cases and pay referral fees in recognition of the valuable contributions of referring attorneys (in accordance with the Rules of Professional Conduct). We look forward to working with you on your next case. Contact our firm toll-free at (312) 401-4445 to learn more.